Hi welcome to Mr Emma Uzo and Nice to meet you. I made this post to teach you the easiest way to found my stagename on Google Search because I noticed that some of my fan’s are finding it difficult to Google my artist name. The first step is to open your browser and write Mr Emma Uzo and you will found me in your home screen. You can also copy and paste my links on your browser to search. It’s very easy and I hope it helps alot. 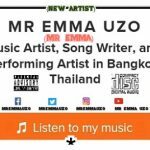 Feel free to follow me on all social media with Mr Emma Uzo and stay tune. Don’t forget to subscribe to my YouTube Channel, Remember to like and comment,Sharing is caring. I’m currently working on my next track coming soon. For booking,Featuring and more enquiry about Mr Emma visit my page. Thanks you so much for your support and believe we will get there soon. Have a wonderful day.